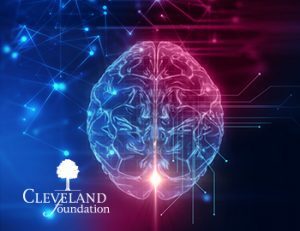 CLEVELAND – The Cleveland Foundation board of directors has approved a $1.5 million grant to Case Western Reserve University (CWRU) to support the development of the Cleveland Brain Health Initiative (CBHI), linking the work of neuroscience leaders from CWRU, Cleveland Clinic, University Hospitals, MetroHealth Medical Center and the Louis Stokes Cleveland VA Medical Center. The goal is for the CBHI to become a national center of excellence to advance the understanding and treatment of a myriad of brain diseases and disorders that affect nearly 100 million patients in the U.S. alone, from early childhood to adulthood, including Alzheimer’s disease, Parkinson’s disease, autism, epilepsy, schizophrenia, depression, and traumatic brain injury. The foundation’s grant, the largest gift to date for this project, will support the recruitment of some of our nation’s most promising scientists to Cleveland and the CBHI as junior faculty members. The proposed CBHI will be housed at Case Western Reserve’s School of Medicine, with some research programs that include patient consultations, clinical trials and treatment taking place at the initiative’s affiliate hospitals throughout Cleveland. President Snyder also expressed gratitude for the support of the Mt. Sinai Health Care Foundation, which last year awarded the initiative a $1 million grant. Among those involved in the initial conception of the institute were Anthony J. Furlan, the medical school’s Gilbert Humphrey Professor of Neurology and co-director of the Neurological Institute at University Hospitals Cleveland Medical Center, and Anthony Wynshaw-Boris, Professor and Chair of the Department of Genetics and Genomic Sciences at Case Western Reserve. This local CBHI will support recent efforts nationally and internationally to coordinate data and information from brain science projects around the world. Last September, the International Brain Initiative was launched during the United Nations General Assembly and the United States’ BRAIN Initiative was launched by former President Barack Obama in 2013. Over the past three years, the National Institutes of Health has awarded more than $250 million to 400 investigators working at 90 institutions as part of the BRAIN Initiative. Among those researchers is the Cleveland Clinic’s Chair of the Neurological Institute Dr. Andre Machado, who received a nearly $5 million grant last year for clinical trials testing deep brain stimulation for stroke survivors. That grant helped lead to a first-of-its-kind surgery earlier this month.